A joyful, painless introduction to the numbers that dominate public argument about everything from the climate and the economy to crime and even whether your bacon sandwich will cause cancer – by the team who created and presented the hugely popular BBC Radio 4 series More or Less. Numbers scare and depress many of us, but politicians, journalists and everyone in power use them all the time to persuade and bamboozle. 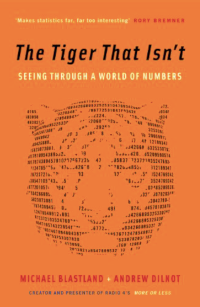 Much of this can be cut through simply and quickly – and The Tiger that Isn’t shows us how. Better still it can be understood without any jargon, any formulas – and in fact not even many numbers. Instead, the book aims to make us more intuitive and skilful critics of the blizzard of quantified information and evidence that comes our way, by using a few really simple principles, vividly described. These help us to see quickly when maths, statistics and numbers are being used to spin and play tricks – or create policies which can lead to waste, deception, failure or harm. First published by Profile Books in 2007. The Economist (An Economist book of the year 2007). Matthew Taylor, Chief Executive of the Royal Society of Arts, former advisor to the Prime Minster.